Morgan Persson was born in 1978 and grew up outside of Varberg on the Halland coast of Sweden. As a child, he lived by his grandparents’ farm, far from an arts and culture scene. His father was a woodworker and his mother was a cook; growing up, Morgan’s greatest passion was volleyball. With no artistic ambitions, Morgan went to a high school in Falköping with an emphasis on volleyball and played on the junior national team and in the elite series. Eventually, he combined volleyball with work painting cars. 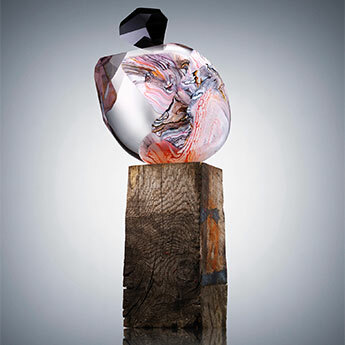 One evening in late winter in Halmstad, Morgan Persson was struck with the entirely unexpected and nearly miraculous inspiration that he should dedicate his life to working with glass. This insight led to an obsession – he looked up and applied to schools everywhere, including Denmark and Småland, and eventually decided to study at the National School of Glass in Orrefors. After working in several different glass studios, Morgan moved to Gotland and spent several years at Glashyttan (the Glass Studio) in Waxholm in the Stockholm archipelago with his friends and colleagues Åsa Högblom and Cecilia Nordkvist. During that period, Morgan Persson developed his own version of the graal technique. In the last ten years, he has become known among graal object collectors as one of the few living practitioners of the graal technique, which was originally developed by Simon Gate and Edward Hald in Orrefors – and especially by their glassblower, Knut Bergqvist. Today, Morgan lives with his wife, four children and pets in Småland’s Kingdom of Crystal – with an expansive forest just behind his house. In addition to Galleri Glas, Morgan Persson is also represented by Culture Object in New York and Graariel in London.